After taking a little time to read over my blog postings, I've noticed something totally odd. Muni is to end the paper pass program and switch to Clipper only. It is starting with the "A" paper pass and disabled sticker, then the youth & senior pass, and finally the "M" pass. "A" and disabled passes must be Clipper by November 2010. Last paper pass/sticker is October. "Y" and "S" passes must be Clipper by February 2011. Last paper pass is January. "M" pass must be Clipper by April 2011. Last paper pass is March. 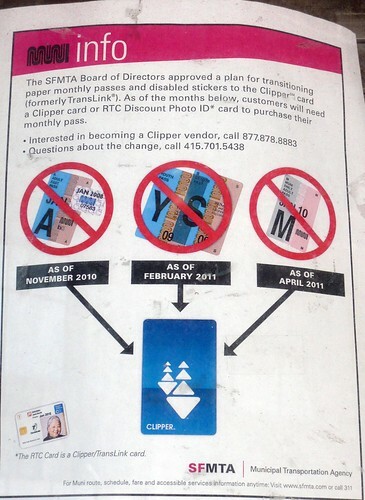 "The existing Muni paper monthly Passes will transition over to the Clipper card. Within the next few months, customers will need a Clipper card (or a TransLink card) to buy monthly Pass. Adult fare Muni/BART “A" Fast Pass and RTC Sticker: October. Senior and Youth monthly passes: January 2011. Adult fare Muni-only “M” Fast Pass: March 2011." "A" and disabled passes must be Clipper by October 2010. Last paper pass/sticker is September. "Y" and "S" passes must be Clipper by January 2011. Last paper pass is December. "M" pass must be Clipper by March 2011. Last paper pass is March. When you look at the two fliers (cable car booth flier vs. press release), they are all a month off. MUNI'S PR DEPARTMENT = EPIC FAIL! So SFMTA PR department, what's the right answer? How about releasing a new flier and admitting to a very serious mistake? Next time, publish a flier that clearly says what month the last paper pass will be issued and the month it's mandatory to use a Clipper card.